We are one of the leading trader and exporter of Full Sleeves Kids Kurta. We offer our kids wear as per customer requirements. This charming peach beautiful kurta suit has worked with rich intricate stone, Gresham, sequin beadwork and designed with embroidery neckline. 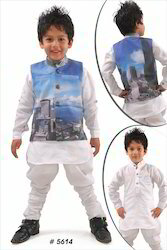 Looking for Kids Kurtas ?